"Do you think I'm bad?" Everybody snobbishly likes to say that the book is always better, but it's hard to think of an American writer of the first rank who fared better in Hollywood than John Steinbeck. John Ford's film of The Grapes of Wrath is an extraordinarily visual evocation of Steinbeck's prose; these days, the novelist's East of Eden is getting more pub courtesy of Oprah. At times it reads as overly schematic and reliant on the Biblical story on which it is so consciously modeled; those aspects actually serve the movie version well, though, and under the sure directorial hand of Elia Kazan, it's a moody, well-realized picture of time and place. It's terrifically specific about the Monterey peninsula of Steinbeck's youth, and it's a landmark movie in many respects for its moody portrayal of adolescence. And that's because of its central performance: I've pretty much buried the lead, but East of Eden may be most notable for being the first feature film starring James Dean. His work here and in Rebel Without a Cause defined the Dean image in his time�no doubt some will be drawn to this picture only because he's in it, but there are plenty of reasons to stick around besides him. Kazan announces the grandness of the undertaking with an overture, and neither he nor Steinbeck shy away from the mythical: this is their retelling of the story of Cain and Abel, and the crux of the matter is whether or not one can in fact be born unredeemably bad. The great patriarch here is of course named Adam�Raymond Massey plays Adam Trask, a Monterey businessman who dreams of transporting produce in ice-packed train cars, and envisions the fortune to be made in frozen vegetables. His relationships with his two sons couldn't be more different: Aron (Richard Davalos) is the good son, Cal (Dean) the prodigal one. Aron is polite and respectful, and is busy courting Abra (Julie Harris); Cal is moody, surly, forever feeling and seeming out of place. He has become inappropriately fascinated with a woman from the wrong side of the tracks, and he can put two and two together: the story that his father has been telling for years, about the boys' mother having died, isn't holding up well under Cal's scrutiny. (Aron is of course trusting and unquestioning, making him either a dutiful son or a simp, depending on your point of view.) We learn with Cal the secret that Adam has been hiding: the boys' mother, Kate, simply up and left (though not before shooting her husband in the shoulder); and now she's the proprietor of a house of ill repute on the other side of town. As Kate, Jo Van Fleet gives a fierce, venomous performance; years haven't done much to salve this old wound, and when Cal comes round, the force of memory is electric. The central and defining performance here, though, is Dean's. He perfectly captures Cal's inchoate, unarticulated sense of rage and rebellion and anger�and yet he's so hungry for his father's approval and attention, so deeply fearful that he's a hopelessly bad apple, that he'll do anything for Adam, for good and for ill. Raymond Massey embodies old-style Hollywood acting here, in the best sense�he says what he means and he means what he says, and that upright sensibility makes for an extraordinary contrast with Dean, as much the emblem of the coming of Method acting as Marlon Brando. And he really was just a beautiful young man; he's mesmerizing, even when, especially when, his Cal can't get out the words. Aron is little more than a plot device, as, after Adam, the principal relationship in Cal's life is with Abra�she's obviously a little fearful of Cal, and later is a little too happy to see him. Julie Harris is wonderful at conveying the girl's innocence, and her sense of dread that, despite herself, she's being courted by the wrong Trask brother. One of the best scenes in the movie occurs when Abra and Cal get stuck on a Ferris wheel, for it's as if being off the ground has allowed their emotions to be heightened, too. (It rivals the face-off between Harry and Holly in The Third Man for the distinction of being the best scene ever on a Ferris wheel.) And while there's no shortage of melodrama, Kazan isn't content merely with that. The story starts in 1917, and the film's portrayal of anti-German hysteria in California at the onset of World War I is frightening; there's an operatic, even balletic quality to a sequence of the locals getting ready to riot, and Burl Ives as the sheriff is a soothing presence, the one man who can keep things from boiling over. Even more impressive is Kazan's camera technique during the scenes of Cal's greatest emotional anguish, for he uses Dutch angles to communicate the sense that something is awfully askew. But throughout Dean is the straw that stirs the drink�it's a pity that we can count his movies on one hand, and you can't help but watch and think about what might have been. Image Transfer Review: Kazan had a keen eye for locations, though the Monterey peninsula may look less striking here on a small television than it would in CinemaScope and WarnerColor on the big screen. A strong transfer; the colors hold up well, the matte shots less so. Audio Transfer Review: The score tends to be syrupy, and there's a bit too much of it; but the remixed 5.1 track keeps the dialogue reasonably clear, even when Dean does some of his trademark mumbling. Extras Review: Disc One features a trailer, heavy on the Steinbeck, and proclaims this "the frankest motion picture ever made!" And, there's a commentary track from my close personal friend Richard Schickel. He does way too many of these, and seems to do little or no preparation, but here he's better than usual, in part because he's knowledgeable about Kazan�he's particularly interesting on the Kazan/Dean relationship, and providing information on some of the other cast members. Still, he peters out toward the end of the film; this one isn't as atrocious as some of his other efforts, but that's pretty faint praise, though it's hard not to grade him on a curve. The documentaries on the second disc are worth more than a casual glance, too. Forever James Dean (59m:44s), directed by Ara Chekmayan, was made in 1988, and features interviews with the actor's friends and colleagues, including Julie Harris; there's the obligatory trip to the Griffith Observatory; lots of old family photos and film clips; and a discussion of how, after his death in a car crash in 1955, anything and everything connected to him became a cherished relic. East of Eden: Art In Search of Life (19m:27s) features Steinbeck scholar Susan Schillinglaw and the writer's son, Tom, discussing the book; Schickel appears here too, as does Julie Harris, and even Kazan, who discusses casting Dean, and the on-set antagonism between him and Massey. Deeply fascinating is a black-and-white Dean screen test (06m:18s); his back is to the camera for much of the scene, but still, all focus goes to him. He's featured in two deleted scenes (19m:22s) as well; one is with Davalos, the other with Harris, and the package here includes retakes and coverage. Wardrobe tests (22m:14s) might sound tantalizing, but it's twenty minutes of the actors standing around silently in clothes. Much more intriguing is footage (14m:40s) from the movie's New York premiere�Martin Block serves as emcee for the black-tie event, and he interviews not only Steinbeck, Massey, Kazan, and producer Jack Warner, but also Kazan favorite Eva Marie Saint; Red Buttons; Imogene Coca; Carol Channing, with Joel Grey; and First Daughter Margaret Truman. 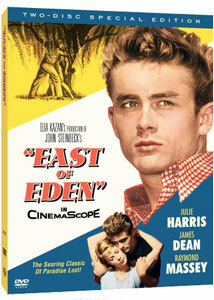 Even had James Dean's life not been cut short, we'd treasure and celebrate his debut performance. He's the best thing in this very good movie�it's got more than its fair share of melodrama, but Steinbeck and especially Kazan bring such empathy to the characters that it never gets soapy or overdone. The extras are pretty worshipful, but that's no surprise, given the James Dean industry that's sprung up over the last half century; there's plenty to mull over here, and a few extra bits of Dean footage that will be cherished by his most ardent fans.